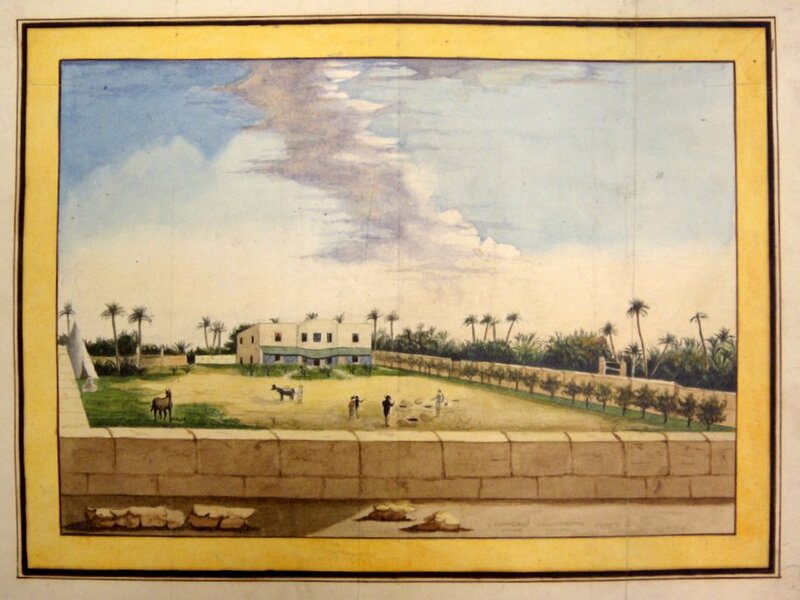 The site of the first consulate was held by the British government under a perpetual lease, at a fixed and invariable ground rent, granted in 1742 by one of the Karamanli family, the reigning princes of Tripoli during its independent era. The lease records were apparently destroyed after a plague in 1836, but the lease contract was renewed in 1851. 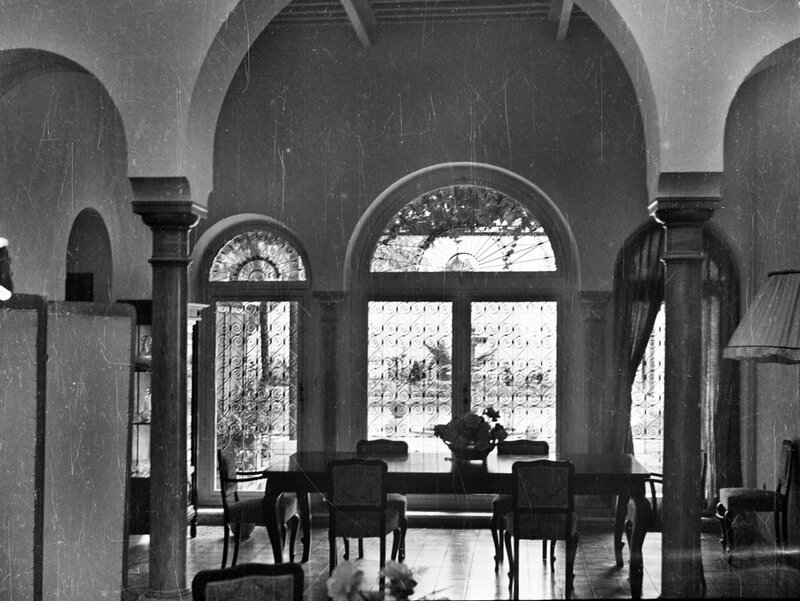 The building on the site was altered from time to time: it was described by a visitor at the end of the nineteenth century (Harry Johnston in The Story of my Life p.345) as having an aggressively blank exterior but ‘inside it was a delightful Moorish palace, with patios and hanging galleries, bananas, palms and flowers, rich carpets, and an array of curiosities, classic and mediaeval’. 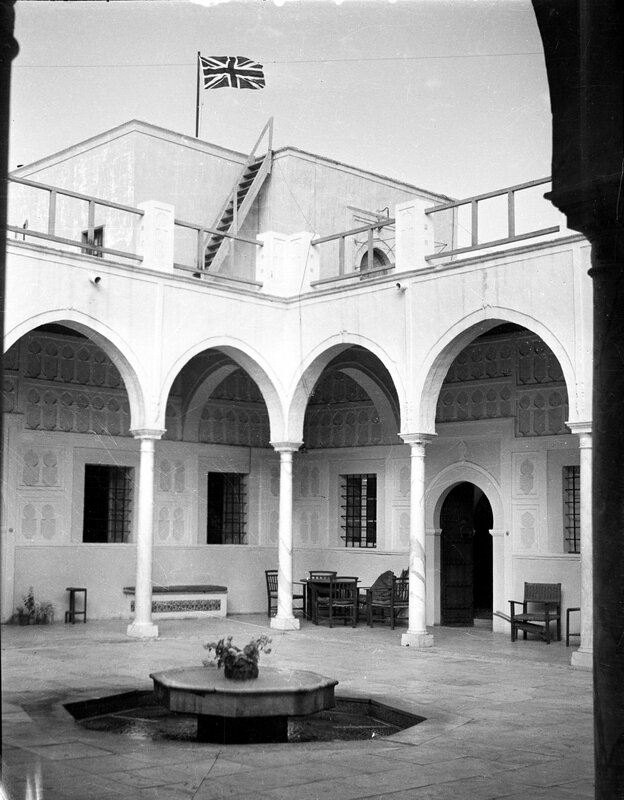 The landlord of the old leased house in central Tripoli changed in 1910 when Mustapha Ben Dau bought the freehold of the property for 209½ napoleons from Ahmed ben Abdessalam. In 1914, the premises were overhauled and electric light installed, after which the consul-general declined to consider Ben Dau’s demand for an increase in rent. Ben Dau responded by refusing to accept any rent at all and took the consul to court: he lost, then appealed and lost again. By the mid-1920s, consuls were keen to move elsewhere as the building was now in such a degraded district. 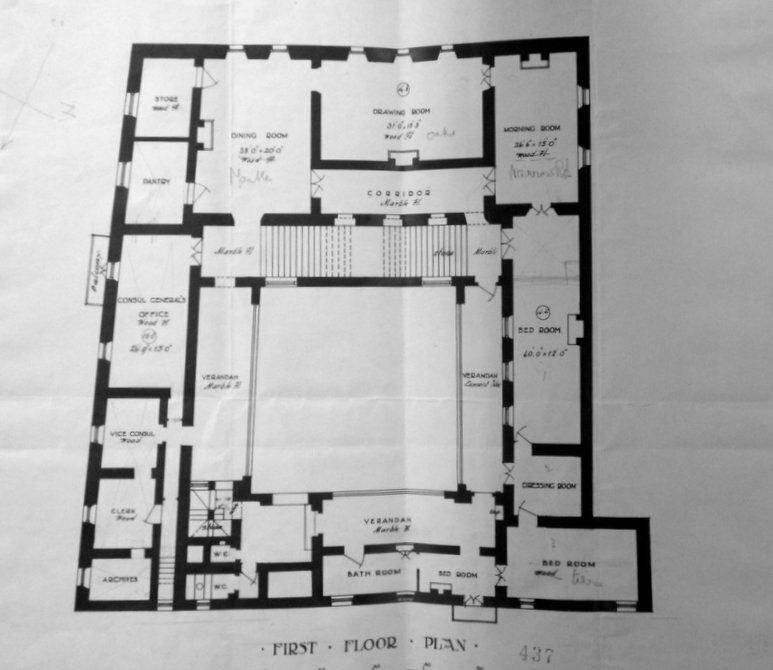 Consul Dodds had plans drawn up in 1928 for a new consulate but they came to nothing. 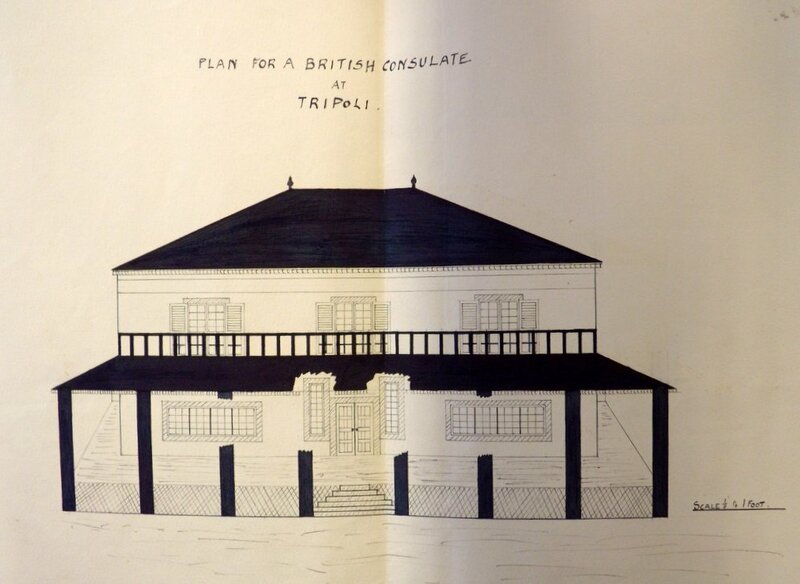 But, to establish full rights to the original property, the British government bought it from Ben Dau’s heirs for £300 in 1930 and three years later sold it for £1,500 to Signor Antonio Varaschini, who was the agent for Fiat, honorary Swedish consul, president of the Tripoli Aero Club, and had an English wife. 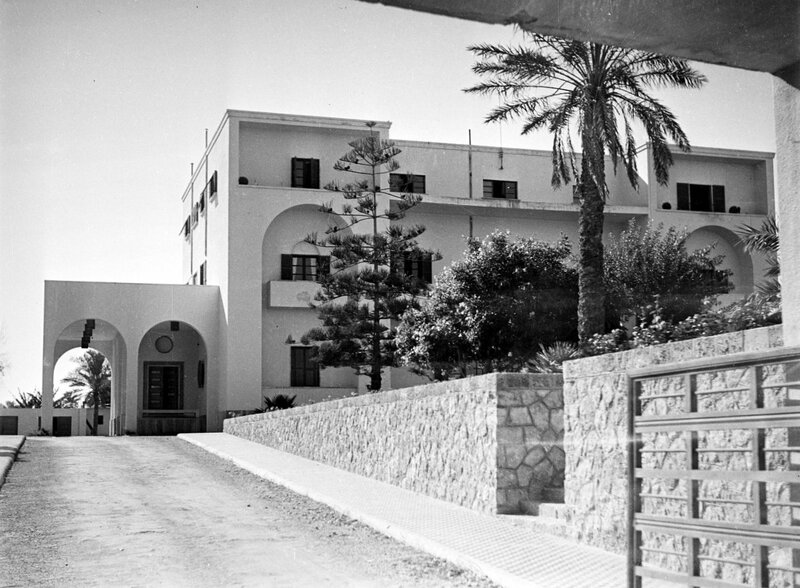 The consulate, however, continued to lease the property from Varaschini until evacuating Tripoli in 1940. In the late-1940s, the building was being used as a store by a Maltese coffin maker. It was restored by the Libyan authorities between 1987 and 1993 and is now [?still] an Historical Museum or House of Culture. 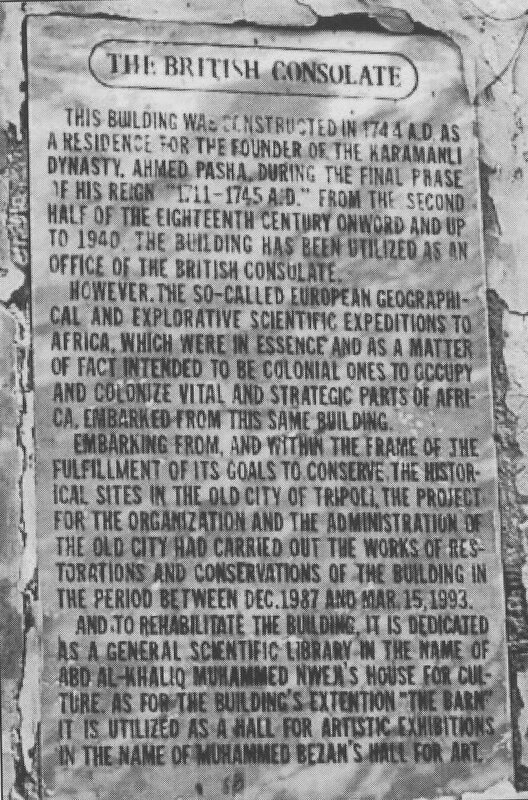 The almost 200-year occupation of the building as the British consulate is recorded in English on a 1993 commemorative plaque fixed to the exterior (the wording also takes the opportunity to criticise the motivation of the explorations mounted from this building). 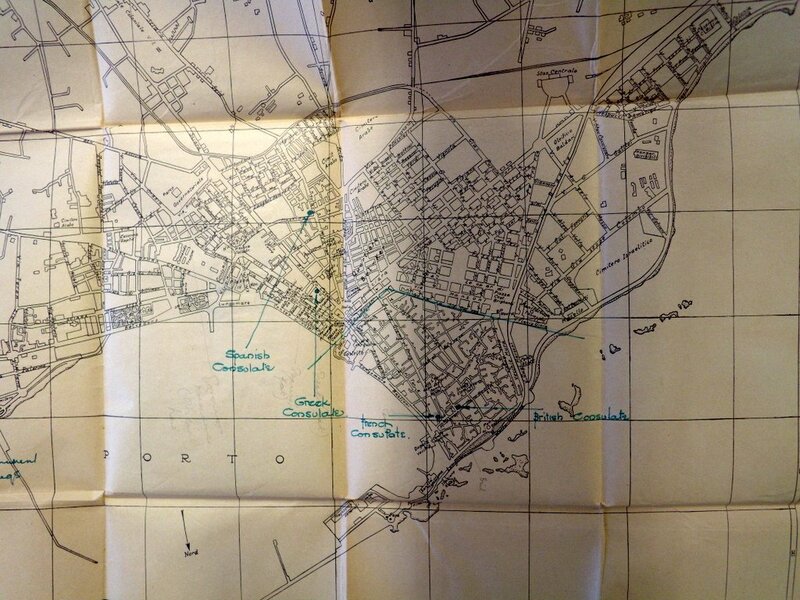 1930 plan of Tripoli with British and other consulates marked. Consul Dodds’ proposed new consulate, 1928 (never executed). Hanmer Warrington’s private villa, completed 1820. Date of painting unknown, probably 1860s. 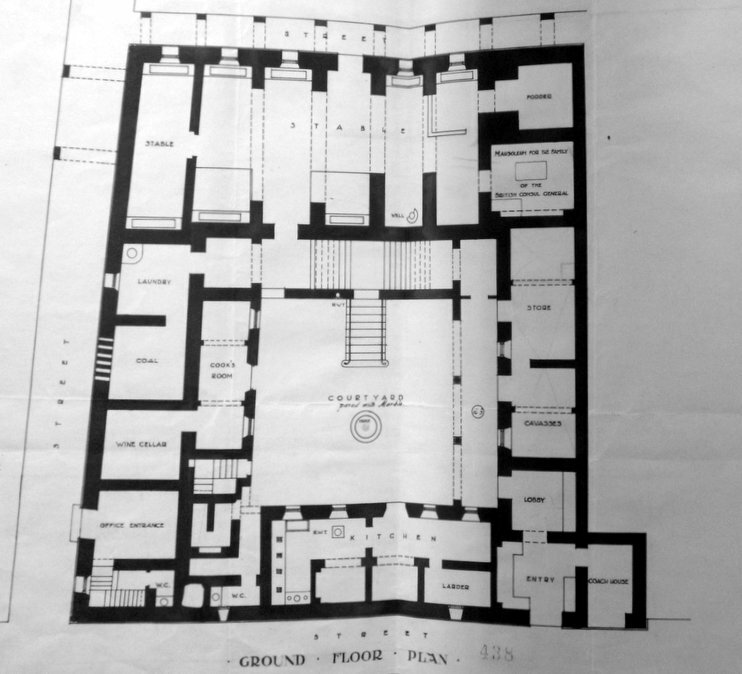 Ground floor plan of consulate building, 1906. 1993 plaque on the wall of the former consulate building. After the Italian and German forces were expelled during the Second World War, Tripolitania and Cyrenaica were put under British military administration until 1950. Libya attained independence in 1951. The British minister, raised to ambassador in 1954, moved into a leased residence in 1952 that had just been converted for the purpose from the former ‘A’ Mess: the address was 2 Sharia Shatt. The residence was sequestrated by the Libyan Arab Republic in 1971. 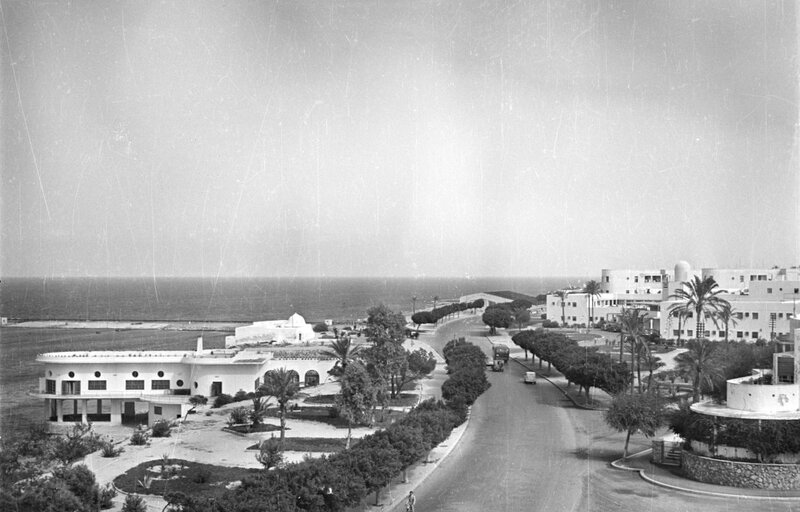 The consulate offices were first leased at 30 Lungomare Badoglio, and subsequently at 30 Tariq Al Fatah. 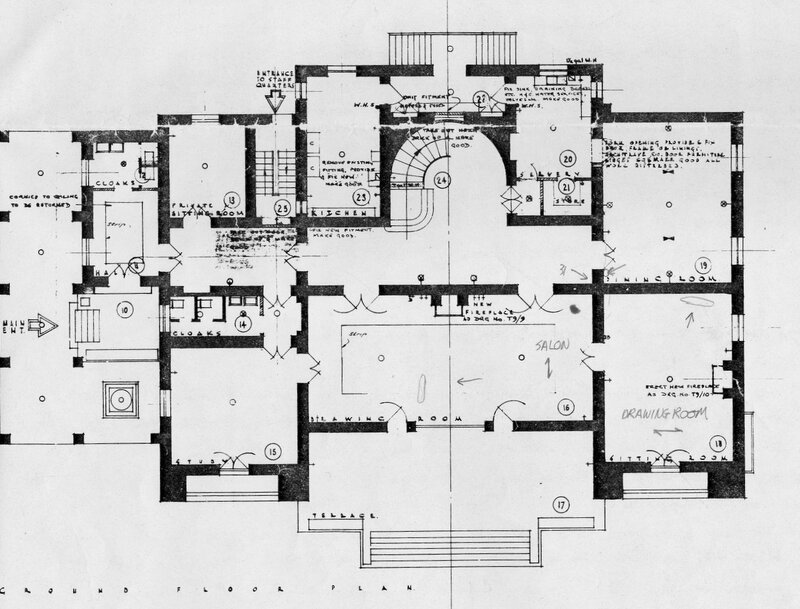 Ground floor plan of residence, 1952. 1951 photo of which buildings? Which building is this? 1951 photo. Rear view of same building – flats??? 1951 photo. Under its constitution, Libya had two capitals, both on the coast, at Tripoli and Benghazi, and the seat of government was intended to occupy each in alternate years. For the British mission in Libya, this meant in theory that when the ambassador moved to one city, the consul-general moved to the other, swapping houses each time. 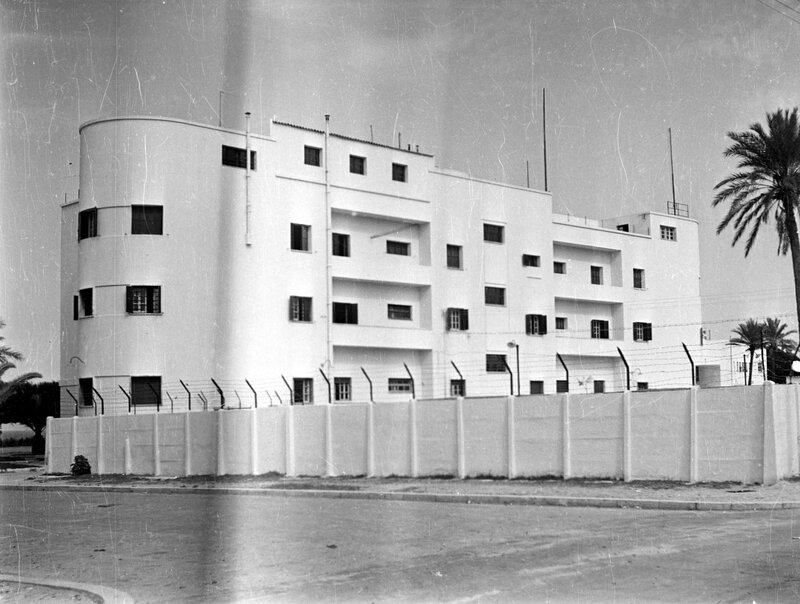 A lease for a residence, called Mosquito House on Sharia Nasser, was initialled in 1952. The offices were leased at 15-17 Sharia Omar Scennib. 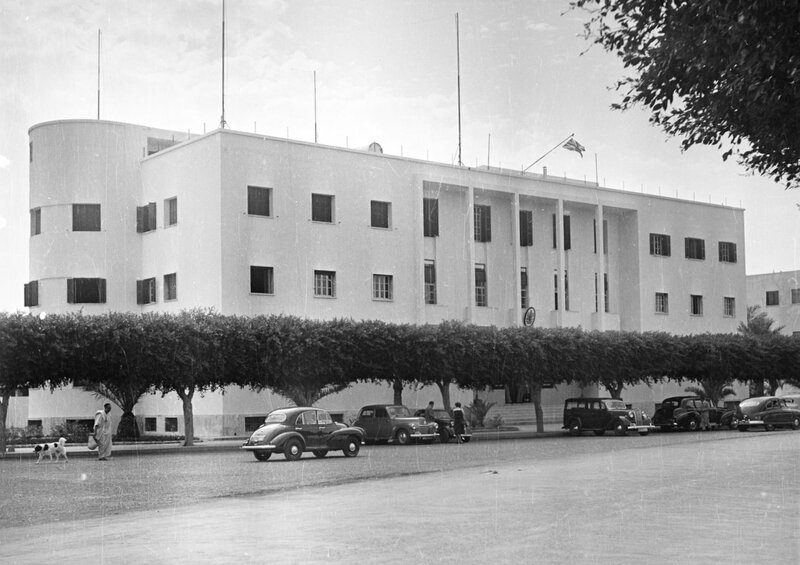 In practice, the seat of government never moved from Tripoli after 1954. The Post was closed in 1977. For the few times in the early 1950s that Benghazi served as the seat of government, the king, his ministers and the diplomats made a further 130 mile migration eastwards to Beida, in the Cyrenaican hills, for the hottest summer months. The Libyan government briefly had plans to build a grand administrative centre here, in which the British government reserved a large plot. Meanwhile, it leased a villa at Beida for the staff, called Villa Salem after its landlord, while the ambassador had his residence at nearby Cyrene, by then no more than a small and isolated village. This leased one-storey property was called the summer rest house, or Villa Graziani, and there was an adjacent cottage: they were available for use, by senior and junior staff respectively, when the ambassador was not in residence. The lease of Villa Graziani was abruptly terminated soon after the 1969 coup.